[Craig Distl] MORGANTON, N.C. - Summertime isn't the only time for folks to enjoy outdoor activities in the Blue Ridge Mountains. 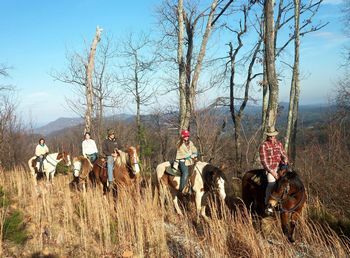 Poco Rhythm Mountain Retreat, located on Burkemont Mountain in southern Burke County, offers horseback rides to individuals and groups throughout the winter. The ranch has access to more than 30 miles of trails on its property and in the adjacent South Mountains State Park. Rides range in length from one to six hours. Each ride includes safety instruction and trail guides, and utilizes trail horses born on site and raised by ranch owner A.J. Hodge, a certified horse trainer. "We have beautiful mountain trails," says co-owner Juleigh Hodges. "The rides are through the mountains on logging roads. They go into the woods and up to where you have great views." Poco Rhythm Mountain Retreat also has trails for hiking, as well as three cabins for rent. "We adjust our packages to suit what people want. We offer trail rides and hiking trails, and have cabin rentals, too," says A.J. Hodges. "It's not a resort, it's a retreat." The ranch sits at an elevation of 2,400 feet with panoramic vistas. On a clear day it is easy to see iconic Blue Ridge peaks like Table Rock, Mount Mitchell and Grandfather Mountain. "It's a specialty place - you don't find many places that offer cabins and trail rides together, where you can stay and ride," says Juleigh Hodges. "And we're not really remote because Morganton is nearby, but you feel like you are remote." Call for information on Trail ride prices and Stay-and-ride packages (828) 433-1278 or visit: http://www.pocorhythm.com/.